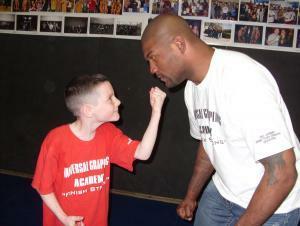 Founded, owned, and operated by Hall of Fame - Mixed Martial Arts, Man of the Year Inductee Dr. Tyson Johnson Ph.D. This incredible program is known world wide for transforming ordinary people into extraordinary athletes! Our program is for men, women, and children of all ages. It is a Cardio Combination of runs, drills, circuit training, and technique review. We offer a wide variety of moves that will work in real life situations and athletic competitions. The safety and care of all students is paramount. This is a progressive program that is designed to help everybody expand their fitness, cardiovascular, and psychological abilities. We strive to bring out the best in each student through positive motivation, team work, psychology, and constant review. Many other teams have sent thier students to the UGA for their specialized training courses, and that includes both the U.S. Military and Law Enforcement Personel. We provide a safe and structured program for the Better World Youth Program that aids in the development of young athletes who are underpriviledged but hope to become world class athletes, and better rollmodels for their communities This only happens through the kindness of businesses and individuals such as yourself who can help to sponsor these children. We teach Olympic Wrestling, Judo, Jiu Jitsu, Kick Boxing, and Sambo. 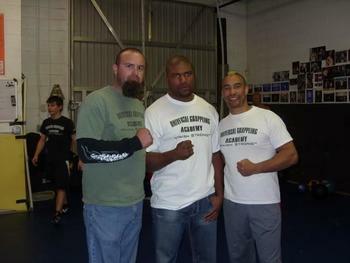 The Universal Grappling Academy was established in 1990 by Wrestling & Martial Arts competitor Tyson Johnson. The UGA has worked with and or has been associated with in one way or another many Top named athletes such as Urijah Faber, Bas Rutten, Dan Severn, Keith Jardine, Tank Abbott, Don Frye, Diego Sanchez, Mac Danzig, Dan Henderson, Tedd Williams, Urijah Faber, Tyson Griffin, Phillip Miller, Randy Couture,Ken Shamrock,Tito Ortiz, Joe Stevenson, Bobby Hoffman, Quinton Jackson, Team Rampage, Rashad Evans, Eddie Bravo, The Bull Pen, WCG, and many more.